I wonder how far we have really come when the current Government proposes to make meal breaks more flexible (meaning optional in some circumstances), strikers will have their pay deducted, employers will be able to opt out of collective bargaining and then employ workers on individual contracts (with terms and conditions less than those in the collective). Employers will be able to change working arrangements with only 4 weeks notice and vulnerable workers, such as cleaners, will not have certainty of employment if their place of work has a change in management. It will be even more difficult for union representatives to have access to workers on worksites under the proposed changes. The Government claims that more flexibility will benefit employer and employee but because the employer generally has all the power now, poorer working conditions seem inevitable. In the 1950s and 60s New Zealand had a far more equitable working environment and most families could maintain a good lifestyle on one income. Most managers and CEOs didn't earn incomes much more than a few times what their lowest workers were paid, but now we have CEOs earning up to 120 times their lowest paid worker. While CEOs regularly get sizable increases to their salaries (Warehouse Group CEO Mark Powell recently had a 68% increase), 48% of workers got no pay rise over the past year. Demonising unions has always been a factor in the industrial landscape and the word 'union' is generally used in a derogatory way. When teachers speak out against the government's proposed changes to the sector, the government often dismisses those arguments by claiming the concerns come from 'a union'. The word union is used very manipulatively by the Government and employers and has effectively eroded the status and image of unions to the extent that workers who would benefit from belonging to one, feel discouraged to do so. Federated Farmers is a Union for farmers and BusinessNZ is a union representing employers interests, yet you rarely hear the word union used in relation to these groups. It has recently been revealed Federated Farmers have even received financial support from the Government. Less than 20% of workers are unionised now and the largest and strongest existing unions tend to represent professional groups. The balance between employer interests and the workers is an important one and this balance has clearly shifted heavily in the employers' favour over the last thirty years. Most families cannot survive on one wage any longer and the minimum wage is now considered to be well below a living wage. 40% of children living in poverty have parents in work and the working poor is a growing demographic in New Zealand. Security of employment is a luxury now with workers increasingly casualised and forced to remain on call for uncertain hours. Financial commitments such as mortgages are hard to support when monthly incomes fluctuate and many families end up in debt through having to borrow to get through lean weeks. Many workers have more than one job to try and boost earnings and, for many, their hours of work will go well beyond the 40 hour week to meet work expectations or to make ends meet. With around 13% of New Zealand's workforce working more than 50 hours a week, we work longer hours than most OECD countries. Working conditions and health and safety are also eroding in many sectors. Longer hours, tired workers and lack of continuity can cause more accidents and working nightshifts for extended periods can create mental health issues. Some sectors have become extremely unsafe, with forestry workers in particular suffering unacceptable numbers of injuries and deaths (ten forestry workers died in 2013 alone). There have been countless examples of worker exploitation and disregard for health and safety in New Zealand over recent years. In many cases there is no real accountability for employers and it is the workers who are left to suffer. Mismanagement of Solid Energy saw the loss of hundreds of jobs and yet the responsible CEO was place on gardening leave while still earning his $1.3 million salary. Peter Whittall was responsible for the deaths of 29 miners and yet escaped charges and is free to manage other mines. Migrant workers are also being exploited in New Zealand. Rather than employing New Zealanders on legal minimum wages, migrant workers are imported who don't understand market rates and can be tricked through dodgy contracts that over-charge for accommodation etc. Orchardists, the food industry, the construction industry in Christchurch and the Dairy industry have all been guilty of exploiting imported workers. The very worst exploitation of workers occurs within our territorial waters and on foreign owned fishing boats where virtual slave labour is common. Men are often taken against their will from struggling Asian countries like Laos and are forced to work in shocking conditions where beatings, sexual abuse, 18 hour days and death and serious injury are common. Men lost overboard are abandoned, serious injuries are left untreated and all for minimal or no pay at all. Michael Field's recently published book, The Catch, graphically describes the horrific underbelly of the fishing industry. Anzac Day has become one of our most widely recognized commemorative events, with growing numbers of people remembering and honoring the sacrifice of those who died in major wars purportedly for the benefit of us all. Perhaps workers who make large personal sacrifices in support of our economy should also be recognised in a similar way. Earlier this year I attended a moving service to unveil a memorial stone in Invercargill for International Workers Memorial Day. The 6,000 workers who die in their workplace every day throughout the world deserve recognition as do the 51 New Zealanders who died while doing their jobs in 2013. It is very clear that the balance between worker and employer has shifted too far in favour of the employer and workers are again being undervalued and disrespected. 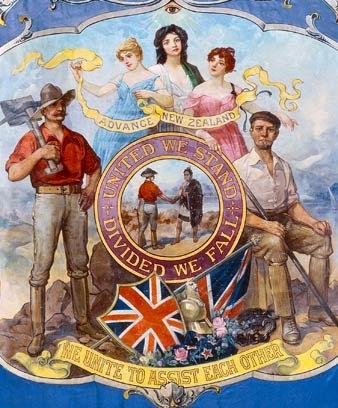 We do need stronger and more effective unions and greater union membership to shift the balance back again. New Zealand is becoming an increasingly unequal society at a rate that is faster than most OECD countries and this trend must be stopped and reversed before the damage done becomes too great. Having 27% percent of our children being brought up in poverty, when many of their parents are in work, is unacceptable in a resource rich country like ours. We could do without unions if every employer acted at all times with integrity. Unfortuantely that does not happen and the focus for far to many businesses has turned to bottom lines on balance sheets. The better they can make them the more their management salaries increase. I was and still am disappointed that unions never made headway in not only wages and conditions but also giving employees the ability to share in profits. I always thought that was the next big step and still do today. What I mean is that they negotiate a fixed % of the companies profits to go into a pool for the staff to share at the end of the year. They do it for the bosses but the workers rarely get a look in. If you think about it pragmatically the often give CEO,s multi million dollar share packages. The CEO,s move on and the only thing they achieve is running to company a bit leaner and a bit cheaper. Imagine if those share packages were given to the workers. They usually stay with the companies far longer and contribute a lot more at the coal face where the actual returns are generated. What would make better sense? The other big thing that is missing is a vision of what a Kiwi working family should be and have. The Govt should spell out what they consider is the ultimate and then we can see and start working towards that. For instance should they be able to afford a house, have a car, afford an annual holiday, have free education for their children and whatever else we think should be the norm. Once that is decided we can talk about things in a constructive manner rather than the over arching comments of child poverty etc we hear today. Good thoughts, Philip. I also like the idea that no CEO should earn more than say 15 times the income of the lowest paid worker. At the moment the minimum hourly wage can earn $29,640 per annum, which would mean the maximum a CEO can earn (if that was the lowest wage) is $444,600. This would encourage a real trickle down when profits and productivity increases and the management want an increase in pay.